I’m posting a bonus book this month because the front page of the blog section is designed to have three entries, and it is bothering me that there are only two. Make of that what you will. But the bonus book is a great one! I picked it be cause my 5 year old has rediscovered it recently, and we’ve been reading it a lot. 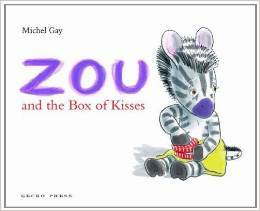 Zou and the Box of Kisses is an English translation of a French book. The publisher, Gecko Press, publishes a lot of these. They are a New Zealand publisher, and my in laws (who are New Zealanders) have sent us quite a few of their books. The books are delightful, and I enjoy seeing examples of great children’s literature from around the world. In this book, a little zebra is going away to sleepover camp for the first time and is worried about missing his parents. So his Mom and Dad make him a box of paper kisses. To make one, they each kiss one side of piece of paper. Then they fold the kisses up and put them in a box, which Zou takes with him on the train. One little zebra on the train is so distraught that Zou decides to share his “lolly kisses” and that act of generosity makes him a train-full of new friends. It is a sweet story, and one that I don’t mind reading night after night!